From the outside, Lost Nation Brewing is not a glamorous-looking place. Tucked in an industrial park on the edge of Morrisville, it’s partially obscured by a bank of orange snowplows, its metal façade softened only by a few hop vines twirling up strings near the front door. Inside, the place looks like any other Vermont microbrewery, at least to the untrained eye. Tubes and pipes snake overhead and into towering silver tanks, some of which are filled with fermenting beer. Puddles from a recent wash-down dot the floor. The back of the 5000-square-foot space holds more steel tanks, for aging, and dozens of kegs stacked toward the ceiling like a silver Tower of Babel. “We designed the brewery to flow,” says brewer Allen Van Anda. He’s a lanky, kinetic presence who, like his partner, Jamie Griffith, tends toward understatement. Lost Nation is certainly flowing. A little over two months since Van Anda and Griffith shipped their first keg, much of the beer in their fermenters — which hold brews such as gose, saison and Pilsner — is spoken for. The two already have 170 draft accounts around the state, for which they produce 100 kegs a week. What sets Lost Nation’s beers apart, perhaps, is that none wallops you in the face with its alcohol level; at 5.9 percent abv, the Saison Lamoille is Lost Nation’s strongest offering. 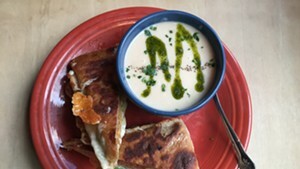 Yet none skimps on flavor, either — and neither does the creative food in the brewery’s tasting room, which is already drawing its own dedicated clientele. Van Anda, 35, and Griffith, 40, met five or six years ago when they were working at Hardwick’s Vermont Soy. When asked why they connected so strongly, both men shrug. Griffith thinks it may have been because they recognized each other’s propensity for hard work. “I think that’s what I saw in Allen, and probably what he saw in me,” he says. They cemented their working relationship as brewers at Trapp Lager Brewery, which Van Anda joined as founding brewer in 2009; he brought on Griffith as his assistant a year later. In 2012, as the von Trapp family planned a dramatic expansion of the brewery, funded with money from EB-5 immigrant visas, Van Anda took his leave. Griffith stayed on a while longer. In stolen moments from family duties — Van Anda and his wife had just had a baby; Griffith has two children — they began shaping the business plan for what would become Lost Nation. And shaped some more — for more than a year. Brewing the right beers was key, of course, but so was nailing just the right size; the partners wanted their brewery to be neither too small to keep up with demand nor too big for them to control. “You’re always chasing your tail, or it’s manageable,” Van Anda says of a brewery’s size. Last fall, when they saw the old Rock Art Brewery space in Morrisville, the pieces fell into place. With a couple of private investors and a loan of “just under a million dollars” from Morrisville’s Community National Bank, Lost Nation became a reality. It took Van Anda and Griffith months more to begin brewing; they had to wait for their Canadian-built system to make it across the continent by train. In the meantime, they ripped the space apart — tearing out old systems, jackhammering cement slabs to put in a tile floor and revamping the tasting room. That space, with its blood-red walls, rustic beams and custom-built draft box, was finished first. “We needed to create a space to chill out” while they finished the work, Van Anda says. The partners tackled the rest of the work methodically, custom designing every detail, including how they would extract maximum flavor from their malt. The solution was an additional mash tun that enables them to put their boil through “temperature rests,” as Griffith calls them — what’s known as step mashing. After the beer ferments, Griffith and Van Anda — like true former lager brewers — pump it into “cellaring” tanks, where it conditions for a few more weeks on yeast “to let the flavors really mature,” Van Anda explains. As for choosing the beers themselves, Van Anda and Griffith followed their instincts, regardless of whether their styles could be easily categorized. “All of our beers make you use your head a little bit,” Van Anda says. They include the gose, a quenching, tart, German-style beer brewed with sea salt and coriander. 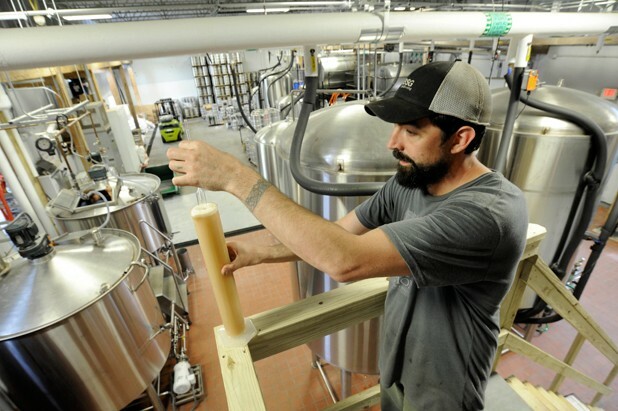 The brewers wanted a “Franconia-style” Pilsner, with a bitter edge and crisp finish, as well as a saison; they also created Rustic Ale, an earthy, dry-hopped amber ale with a vein of bitterness. What they didn’t want to brew was the lynchpin of many Vermont breweries — an IPA. “There are so many good IPAs in Vermont. So we thought, Why?” says Van Anda. The partners began brewing last spring and shipped their first beer on May 8. Bars quickly signed on, ranging from the one at Burlington’s new Hotel Vermont to the Garlic in Killington. A month later, Griffith and Van Anda felt ready to open their tasting room. Walking into that tasting room from the glaring, shiny brewery is like stepping into another dimension. This is a bustling pub, full of music and people nursing pints and smoky aromas from the kitchen in the back. If there were such a thing as a rainbow of earth tones, it might look like all of Lost Nation’s beers lined up on a bar. The gose is the palest of the bunch, its pallid straw color belying a crisp, saline power. On the opposite end is the Pitch Black. Though it resembles a porter, it’s not as inky as its name suggests; rather, it’s a dark beer brewed with smoked malts whose taste mingles with nut and caramel notes. “We wanted people to have all of the qualities of a dark beer but still have it be fresh and light,” Griffith says. As the brewers talk, the room around them becomes increasingly packed — and it’s a Thursday afternoon. Laura Streets, coordinator of the Vermont Brewers Festival, relaxes at the bar with a friend. A quartet of guys apparently on their lunch break crane their necks to check out other diners’ plates before placing their order. Elaborate food wasn’t originally part of Lost Nation’s business plan. When Griffith and Van Anda decided they wanted to up the ante on the tasting-room experience, they reached out to the Mad Taco’s Joey Nagy. “We said, ‘Hey, got any ideas?’” Van Anda recalls. Nagy did, and he laid the foundations of an upscale tavern menu, albeit one without gouging prices. On June 15, chef Erik Larson began turning out a gastropub-like menu of rotating specials, which on a recent day include a snail- and chorizo-spiked, housemade gnocchi so tender it melts on contact with the tongue. Sandwiches are both sculpturally structured and intense, with options such as a TLT, or smoked tofu with arugula on Elmore Mountain Bread; and a crispy pork schnitzel. As they eat, the pair discusses plans for the future. Right now, they’re producing the equivalent of 3200 barrels a year, with the potential to grow to about 8000. “At this size, we can supply Vermont and a few other states,” Van Anda says. More beer styles are not part of the equation, at least in the near future. “We want to see these [beers] get established first,” says Van Anda. “If you release a million beers...” He trails off, then takes a bite of his sandwich. “We like wild yeasts, though,” Griffith adds cryptically. The original print version of this article was headlined "Beer in Balance."